HRANA reports that the detainees in Ward 350 of Evin Prison, some of whom had spent a day with Sattar Beheshti, held his memorial in the ward on Saturday 10 November. As we have informed before, Sattar was held in that ward for one day before being moved back into the custody of the Islamic regime’s special security unit for control of the Internet and cyberspace activities, such as blogging, Facebook and Twitter. During Saturday’s ceremony, Ward 350 detainees shared with each other their memories of that one day of Sattar’s life in the ward, among those his exultation especially in meeting the political prisoner Gholamreza Khosravi, who has been on death row also accused of cyber space activities, and Sattar’s wish to visit the other political prisoners in Rajaei-shar, another one of the Islamic regime’s institutions of barbarity. 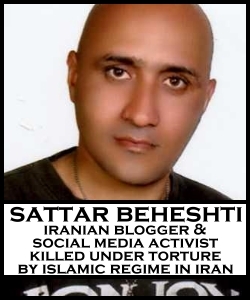 Sattar, who was later beaten to death by the thugs of Islamic regime, was a labourer and a blogger. He had been arrested and detained on 30 October and while in Ward 350, had filed a written a complaint against his torturers. Sattar had noted in his complaint that he had been tortured with different objects and savagely humiliated by the men of Imam. News of Sattar’s death was first unveiled on 6 of October, 7 days after his arrest. Ward 350 detainees have officially attested to the fact that Sattar had been brutally beaten on the head and face, and while helping him in the showers, they had noted evidence of being hanged by his wrists and ankles, a method favoured by the Islamic regime’s thugs to the degree that it has its own special name in the Islamic regime’s barbaric culture.